Until now, high-quality, true Hellenic cooking was a notable absence on the Barcelona restaurant scene. 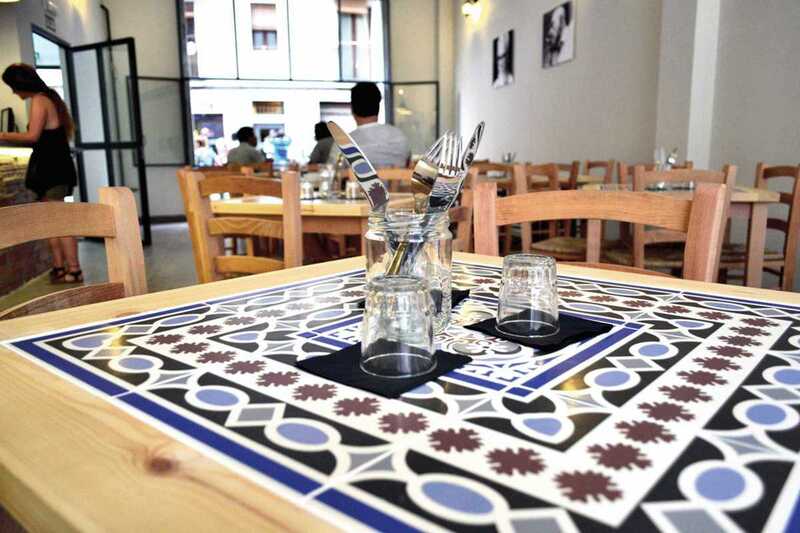 Thankfully, Megara-born Kostis has filled that gap with authentic Greek dishes and atmosphere at his laid-back yet animated Raval restaurant El Magraner Boig (Η τρελή ροδιά). With a Mythos beer or tsipouro in hand, struggle to choose between sublime, fried Feta saganaki, kolokithokeftedes fried zucchini balls with dill, kokkinisto beef stew with French fries (something the Greeks do fantastically well) or arnaki frikase lamb stew with lettuce, spring onions, aromatic herbs and avgolemono egg-lemon sauce. Be sure to order the simply wonderful patates fournou, potatoes roasted in lamb stock that you’ll be reminiscing about for days later. The tzatziki yogurt is creamy and thick, the pita bread the type you rarely see outside of Greece and desserts such as Greek yogurt with sour cherry or rose jam or kataifi angel hair pastry stuffed with nuts and syrup are simple and deliciously satisfying.